A car built by Wiltshire pupils has taken first place in a race to find the most energy-efficient vehicle. The aerodynamic car built by students at Kingdown School in Warminster won by travelling the equivalent of 1,980 miles on a single gallon of fuel. More than 20 schools competed in the annual Mileage Marathon Challenge at Mallory Park track near Leicester. The Kingdown team clocked more than 1,000 mpg than the second placed school. The race at the Mallory Park circuit sacrifices speed for efficiency. The aim is to complete the course using the least fuel possible whilst maintaining a minimum speed of 15mph. David Leater, a design and technology teacher at Kingdown, said that watching the vehicle in action was "absolutely stunning". "It's been four years in the growing and it's as light as we can get it. "It's made from glass reinforced plastic and only weighs about 40 to 45 kg," he said. The small eco-friendly car was driven by 14-year-old Sam Chapman-Hill, from Kingdown School. "The driver, he's only Year 9 and he's very calm and collected. He weighs about five stone - so he's small and light as well," said Mr Leater. 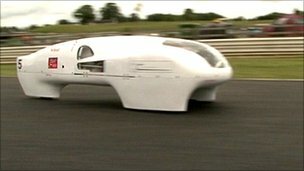 In 2009 Kingdown School claimed first and second place in the Shell Eco-marathon Schools Initiative Class. Ahead of next year's challenge, the team are planning to upgrade the engine in their energy-efficient vehicle. Two hooters - dubbed Swindon's alarm clock - are heard across the town for the first time in 30 years.